Easy chipotle chili is comfort in a bowl with just the right amount of spice from chipotle peppers in adobo, spices, and beans! This is a scrape the bottom of the bowl, what do you mean it’s all gone, kind of chili! The smoky flavor from the chipotle peppers adds an amazing depth of flavor making this one of the easiest and best chili recipes! The family is super busy so I have been focusing on make ahead and freezer friendly meals! Chipotle Chili is all of these – easy, make ahead and freezer friendly! Make a double batch and freeze some for later! Delicious Chipotle Chili is a crowd pleasing recipe! Top this mouthwatering one pot wonder with your favorite toppings and you have the best chili recipe on the block! Why we love this Chipotle Chili! My son, Aidan is a bit of a chili expert! He is my go-to spice guy! He loves to cook and really loves to be the taste tester! I make many different types of chili and he is my helper for most of them! This is my standard beef chili recipe and from here the possibilities are endless! Aidan loves this chili and we developed this recipe together! There is a fabulous smokiness from the chipotles in adobo that makes this chili extra flavorful! The Mexican Chili powder has the perfect amount of kick to make this a family favorite! Chili is one of those go-to meals that is perfect for a weekday meal, perfect for a tailgate party, or pot luck! How long should I cook chili? For this recipe, using ground beef, simmer over a low heat for about an hour will blend the flavors and give you a great chili! Is chili better the next day? Like a good marinara sauce, many say chili tastes better the next day! If possible, make your chili the day before and reheat when ready to eat! Can chipotle chili be frozen? Yes, store in either a freezer bag or use a foodsaver machine to store the chili in the freezer for about 3-4 months. I want to thicken my chili, what can I use? If you need to thicken your chili, use a Tablespoon of flour mixed with some of the chili liquid and whisk together. Add back into the chili. DO NOT add the flour directly to the chili, it can clump and not dissolve well. The chili is too spicy and I need to sweeten it up, what can I add? If your chili is too spicy, adding a little honey will lighten the spice. Add a teaspoon at a time, stir, and check the flavors. What goes well with Chipotle Chili? Tomato Cucumber Salad from Finding Zest is a great salad that would be a nice side salad with the chili. Chicken Mole: Delicious rich mole sauce with chicken! Man this one is good! Mexican Shredded Beef: The beef makes great tacos, quesadillas, and nachos. Lodge 7-quart Cast Iron Dutch Oven – Love this Dutch Oven. Holds the heat well. Easy to clean, affordable! Be sure to brown the beef and drain the excess fat. Ensures your chili won’t be greasy. This recipe calls for low-fat toppings. Full fat can be used, a personal preference. To a large Dutch oven over medium heat add ground beef, onions, and garlic till browned. Drain off excess fat. Add in diced tomatoes, tomato sauce, all the drained beans, and spices. Simmer for about an hour, stir occasionally. Check seasoning, reseason if needed. 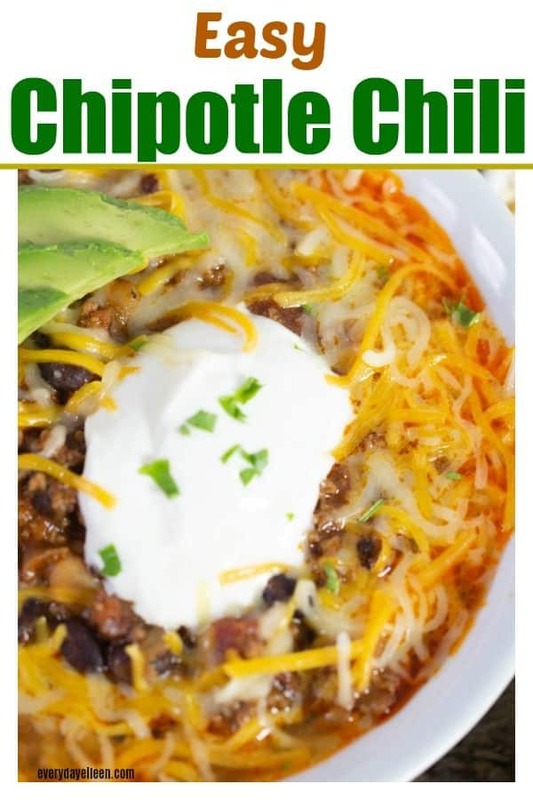 I hope you make this Easy Chipotle Chili! It is so super easy and always a big hit with my family and friends! Have you ever made homemade chili? What are your favorite things to add to your chili recipes? Original recipe published September, 2016 text and photos updated! In a Dutch oven over medium heat, spray pan with olive oil cooking spray. Add the lean ground beef, diced onion, and minced garlic, saute until meat is brown, about 5 minutes. Season with salt and pepper. Drain any excess fat. Stir in the drained diced tomatoes, tomato sauce, drained black beans, drained kidney beans, chopped chipotle peppers, Mexican chili powder, dried oregano, and ground cumin. Season to taste with black pepper and salt. Reduce heat to low and place the lid on Dutch oven. Simmer for about an hour. Stir occasionally. Check seasoning and adjust if needed. Serve in bowls with toppings on the side. Note 1: Chili is best with layers of flavor. Season the browned ground beef with salt and pepper to taste. Personally I sprinkle about 1/2 teaspoon of salt and pepper on the beef a it browns. The calorie count does not include optional toppings as they can vary. 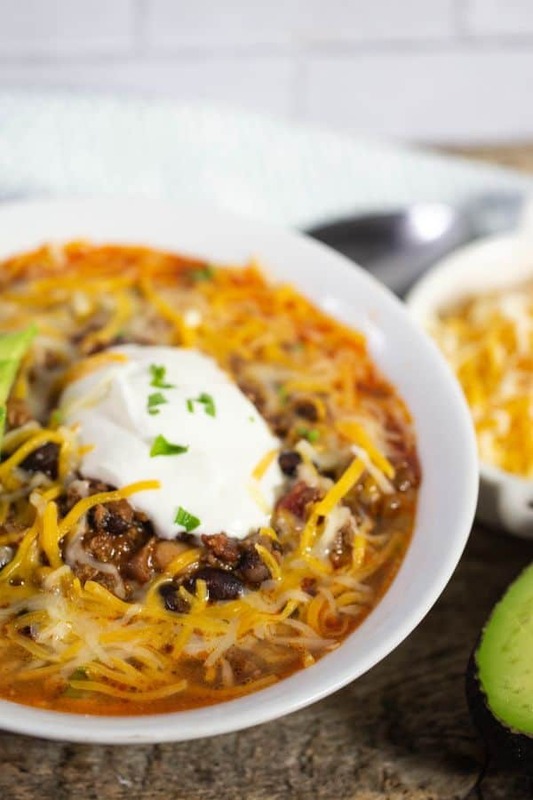 I will never say no to a spicy bowl of chili and love that this recipe is so easy to follow and thanks for all of the tips ! Thank you Anne! This is a good chili! My family loves it! Wow, we made this for our Sunday March madness game! What a hit, thanks for the recipe! Everyone wants your recipe too! I made it Saturday and the flavors were awesome! We heated it up in the slow cooker and everyone helped themselves. Fantastic Gina! Happy you and your family enjoyed the chili! March madness – the games have been awesome! Enjoy! Thank you so much for taking the time to let me know how you enjoyed the chili. Enjoy Noelle! This is a keeper! I love a hearty chipotle chilli. Such a lovely smokey flavour to it. Awesome Dannii, this chili does have a great smoky flavor! I love one pot meals! 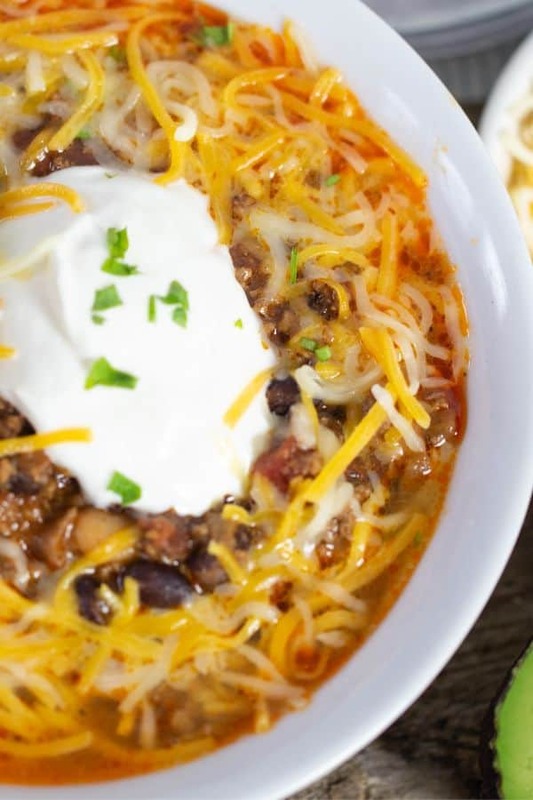 They make cooking just that much easier, and this recipe has so many greats flavors this chili would be great as a leftover! I agree! Love one pot meals! the flavors blend well! Gotta love a good chili your recipe looks very tasty and easy to make now I am carving chili will have to make some. Thank you Adriana! I hope you enjoy the recipe often! Looks very delicious, especially if the meal in the daytime. Looks like I should try to make this, thanks for sharing the recipe. I’m very happy. Cara, we actually just had this chili again last night. I made it in the Instant Pot, delicious! I hope you make it soon and let me know when you do. This has become our go to chili ! I make a big batch and freeze some for another. Day! Absolutely, make a double batch and freeze! Always a great idea! This chipotle chili looks tasty. Have to try this recipe. My husband loves anything that has to deal with chili and my goodness this sounds like a delicious recipe that he would love right away. With beef being our favorite I would love to try this one during my weekends! I totally pinned this! Thank you very much. My husband loves chili. Sounds similar to how I make it at home. It’s such a yummy dish and I always make sure I have left overs for stuffed sweet potatoes or burritos later in the week. Now that looks so good! I must make it. My chili seems a little boring now! I made a vegetarian chipotle chili this week. It’s awesome! Even my kids like it. MMMM this looks and sounds yummy! Chili is a classic favorite! We all love spicy food at home and it’s good to have a chili recipe that would satisfy our love for spicy food. This recipe is a must try, thanks for sharing it with us. My family loves chili and with the cooler weather coming, I can’t wait to whip up a big batch. I like that this recipe gets a little kick of heat from the chipotles. Chili is one of my husb’s fave dinners. I’m making some for him next week and maybe need to use this recipe. The hotter, the better! That looks delicious! We don’t eat red meat so I would love to try this with ground chicken or turkey. Printed! 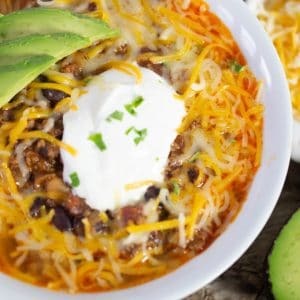 My family loves chili so we’ll most likely be making this in the near future as it starts to cool down and settle into fall! Thanks for the recipe! I’ll have to let you know how it turns out!